Dr. David Jernigan, Biologix Center: Restore Health to Virtually Any Illness Using Targeted Bacteria! A person may have diabetes, asthma, bowel disease, mitochondrial diseases, dysautonomia, autism, cancer, MS, ALS, and virtually every other named illness from alterations in their body's symbiotic (friendly) bacterial populations caused by a myriad of different factors. The mass extinction of a wide range of many friendly bacterial populations in the body has led to the development of widespread chronic illnesses of the body and mind. As shocking as it may seem, a one-time use of an antibiotic can set the stage for illness within weeks to years after using it. Of course, long-term antibiotics can set the stage for serious disease to set in months to years after the fact. Researchers have even correlated the development of chronic illnesses to whether or not a baby was born vaginally or via C-section, since the baby is inoculated with the mother's friendly bacteria as it is traversing the birth canal. Also, a strong correlation is seen in children who were breastfed versus given baby formulas with the development of illness from changes in the microbial community (microbiome). Whether you are thin, or fight to keep the weight off, or obese is now understood to be directly caused by the types of bacteria you have or don't have in your gut! Even your mood and cravings are often determined by the microbial collective! Early disruption of the optimum microbial populations in the body can have lifelong consequences, not just in terms of intestinal function but in distal organs including the brain. The generational use of antibiotics and the subsequent extinction of ideal species of bacteria in the microbiome in a family also can lead to the predispositions to illnesses that were previously thought to be genetic in origin, such as autoimmune diseases. Asthma and other environmental and allergic sensitivities are now recognized to be caused in large part to the absence of key friendly bacteria in the body from antibiotic use, poor diet killing off friendly bacteria, the use of chlorinated/fluorinated water, environmental pollution/toxins, EMF radiation from electronics, and the manipulation of the gene-pool and microbiome with vaccinations. The future is bright with hopes of using hundreds of types of friendly bacteria to combat and eliminate many of the world's worst illnesses. You will be able to implant a specific type of bacteria for weight loss, another type for chronic emotional problems, another for eliminating diabetes, cancer, allergies, and the list goes on. Long term antibiotics are now recognized to be definitely causing more problems than they are fixing, not only killing the harmful bacteria, but also the friendly bacteria that are so important in maintaining health of the body and mind. The era of chemical, prescription antibiotics has largely run its course and thankfully there is something infinitely better positioned to take its place...friendly to humans, tailor-made bacteria designed to seek out and destroy disease promoting bad bacteria in the body. We are entering the era of designer bacteria. Cornell researchers have developed a genetically-modified strain of Lactobacillus bacteria, a commonly found friendly gut bacteria, that can virtually eliminate diabetes in rats, by causing the bacteria to secrete a protein called Glucagon-like peptide 1 (GLP-1). The rush is on to develop better ways to use bacteria, essentially either by restoring what we were all supposed to be born having, or modifying known bacteria to target key aspects of diseases. Researchers are rushing to patent specific types of bacteria that are being grown to replace antibiotics and to replace traditional toxic, symptom-suppressing medications. Biotech companies are being called to catalog and maintain stockpiles of the many types of bacteria for medical uses. Even in Lyme disease, the presence of Borrelia burgdorferi and the many associated co-infections will likely be shown in the near future to be more eloquently addressed by using targeted combinations of friendly bacteria, instead of antibiotics to attack and suppress the bad bacteria from ever being able to cause disease. Indeed, a person's microbiome, in combination with the overall health and healthy lifestyle of the individual, may be the determining factor as to whether someone gets full blown Lyme disease or if they are simply a carrier when bitten by an infected tick, mosquito, or other blood-sucking bugs, not to mention sexual or gestational transmitted Lyme bacteria. It is now apparent that everything you choose to put in your body is affecting the microbiome, the bacterial population that maintains health. Every food choice, personal care product you use on your skin, every chemical fragrance in your house, your laundry detergent, every type of medication...EVERYTHING is either helping or harming your microbiome! Antibiotics, even for short term use, should be avoided, deferring instead to more forms of natural healing that target the body's own ability to prevent the overgrowth of potentially harmful bacteria, while maintaining the harmonious populations of life-sustaining bacteria in the body. To be clear, there are many potential insults to the body that can trigger alterations in the microbiome leading to the named illnesses listed in the first paragraph. The point of this article is to bring to light that restoring the microbiome, and dealing with the many downstream damaging effects of the illnesses can result in never before seen improvements. Obviously when tissues are damaged beyond repair, that will be the limiting factor in the complete restoration of health for an individual. The greatest results will always be seen in those individuals who are newly diagnosed with an illness. The doctors of the Hansa Center for Optimum Health, in Wichita, Kansas are utilizing many of these newly available bacterial strains, in conjunction with many other innovative treatments to achieve better results in chronic illnesses. We are working with novel ways to promote the populations of key types of bacteria that are already present in the body, yet which were being suppressed by various means. We suspect that many of the species of friendly bacteria that are assumed to be missing from a person's microbiome are actual present, yet their population is minimal in numbers. By using strategic treatments to promote the growth of these populations it is our hope that these native bacteria can flourish, providing the missing benefits to the person. The results have been impressive in terms of patient-reported symptom relief. Of course not every aspect of illness can be corrected just by restoring the microbiome. Having a wide range of treatment tools, and taking full responsibility for needing to know how to address the entire body, as opposed to just focusing on pieces and parts of the body as seen in the various specialties in conventional medicine, is what makes the doctors of the Hansa Center unique. 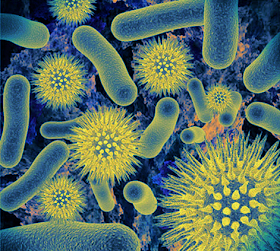 If it sounds scary to purposely send in bacteria to kill bacteria or to treat disease, when you consider that there are always 10 times more bacteria than there are cells in the healthy human body, you realize it is not scary at all. It is interesting that according to research the healthy human body has between 1.5-2 QUADRILLION bacteria and as many as 3000 different species, and over 1000 different types of bacteria just in the intestines! Let’s put that into perspective. There are only 150 trillion cells in the adult human body. There are 1500 trillions in 1.5 quadrillion. That is a lot of bacteria! With thousands of different types of bacteria living synergistically (harmoniously and beneficially) in an optimally healthy body, then health is not determined by the presence of bacteria, but loss of health can definitely be attributed to the absence of key types of bacteria! Yet from the suffering and diseases of so many generations it would seem that bacteria are definitely a cause of disease, right? Overgrowth of the wrong types of bacteria can certainly cause symptoms of disease, but often the direct killing of bacteria doesn’t produce health in the long run. The future of medicine is coming in the form of bacterial wars, strategically pitting specific strains of bacteria to target and shut down the bad bacteria. Stay tuned! My next article will continue with ways to restore your health through restoring your microbiome!